We have been casually looking for our next house in/around Rochester, NY since August 2013. We have seen at least/over 30 houses. I had 30 house papers saved from various houses, pretty sure there were more – but if they were immediate “No’s” I’m pretty sure I immediately recycled them. 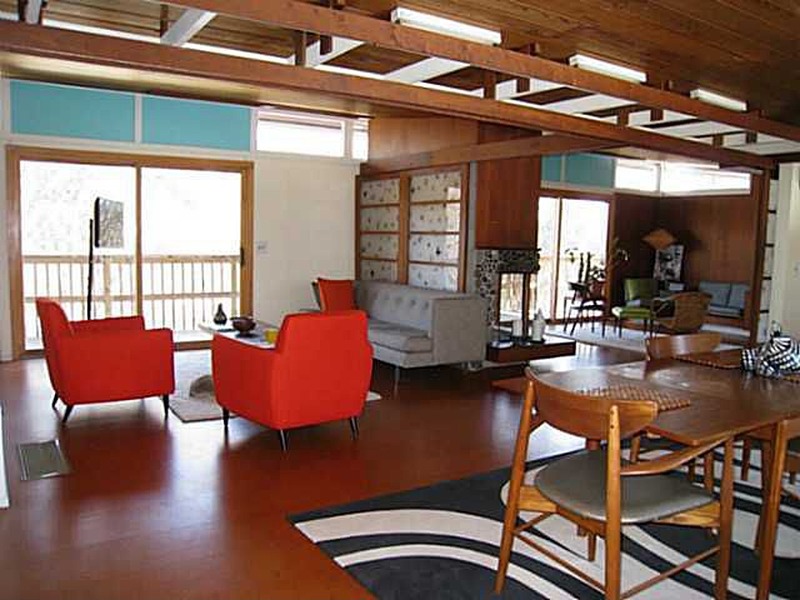 We (I) got excited about this adorable Mid-Century Modern house located in a suburb of Rochester, NY. It happened very fast – kind of on accident. It didn’t 100% meet the specs we were looking for. It didn’t get emailed to us because it was listed under the square footage we put in as our minimum. But when I saw the photos online I was excited to take a look. I literally told our agent “I’m not sure if I’m really interested in this one or I just really want to see it for myself – in person”. I really liked it – even though it didn’t check all the boxes we were looking for. We went to see it literally the night before we were leaving for FL for my grandfathers funeral. We found out that there was another offer already on the house when we got there. Around here (Rochester, NY) there aren’t that many houses that aren’t Colonial and very similar to the next door neighbor’s house. This house was definitely different. One look at the outside and you can see that it is not like everybody else’s house. In addition we got to learn the backstory of the house – not normally something you get to find out about a house you are looking at. 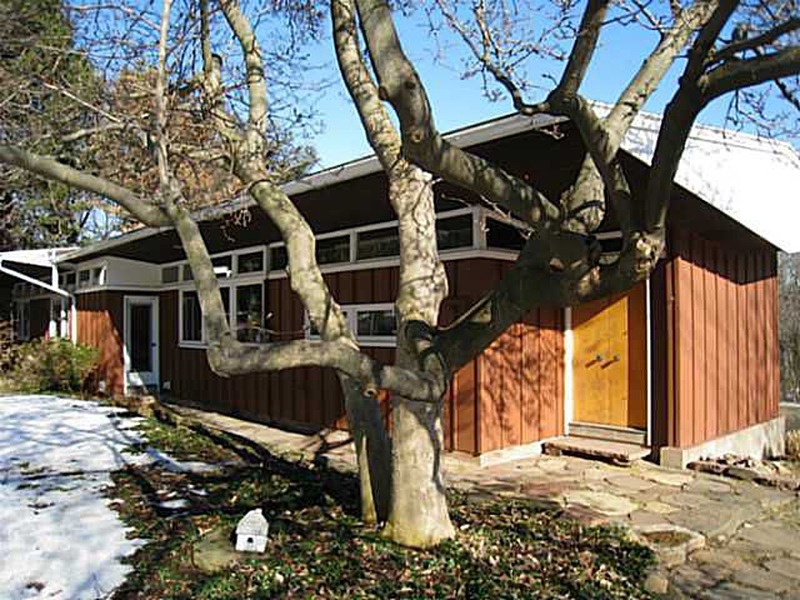 The house was built in 1960 by local architect Bart Valvano for Robert and Audrey Gundlach. Robert Gundlach was an American physicist who invented the modern photocopy machine and helped develop the Xerox Corporation. He had over 195 patents at the time of his death in 2010. The Gundlachs owned and occupied the house until we bought it in 2013. 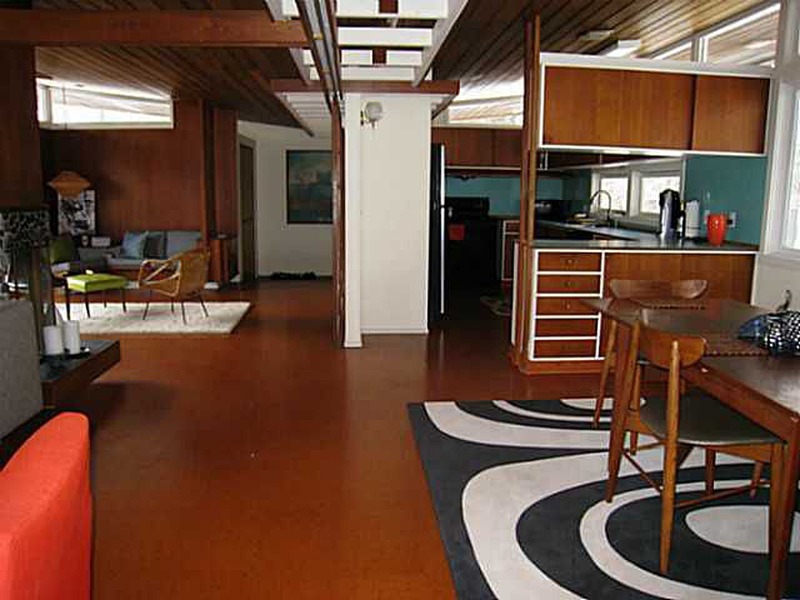 Here are a few photos from the main living space of the house – the reason I really loved this house. It’s so open. How can you not like the built in seating arrangement? 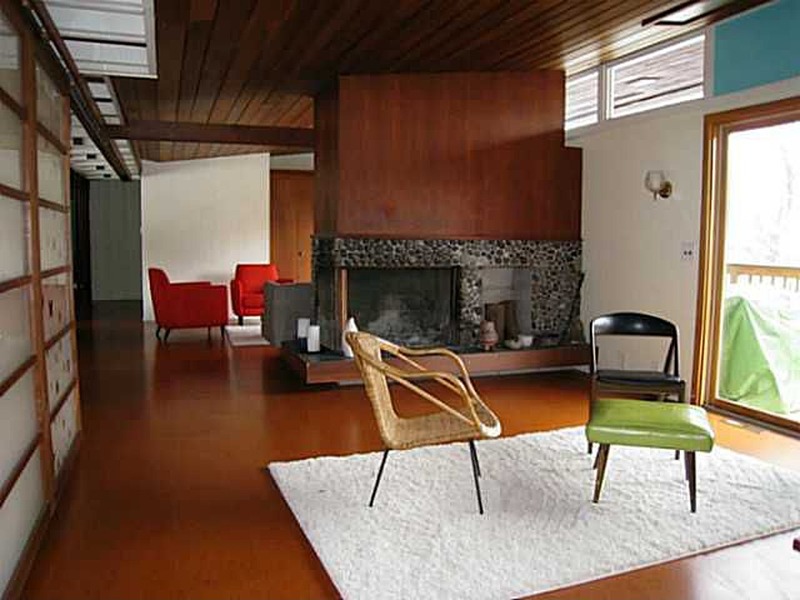 And did you see that wrap around fireplace with the stones – wow. 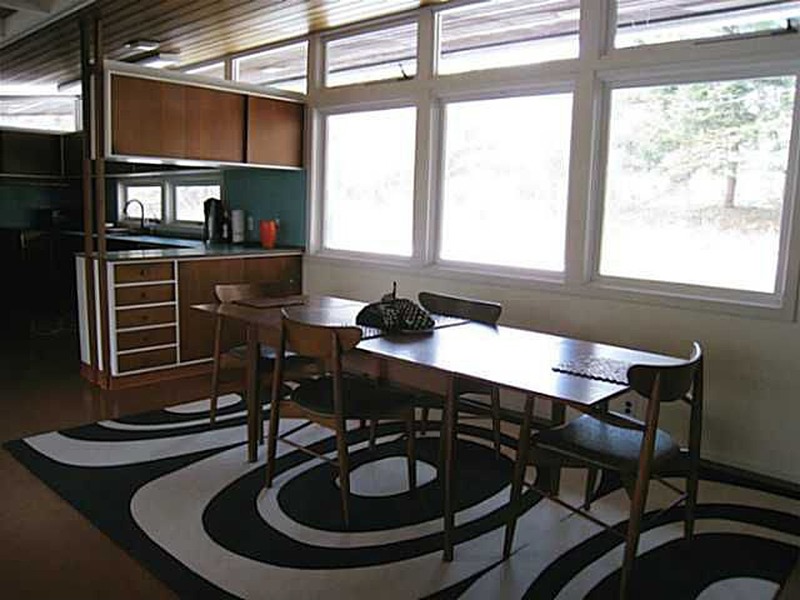 I had mixed feelings on the kitchen – I thought it was neat that it was original, but at the same time it felt closed off from the rest of the living space. We talked about how eventually we might update it by rearranging the appliances so that there could be a bar area to sit/eat at that opened up into the rest of the living space. 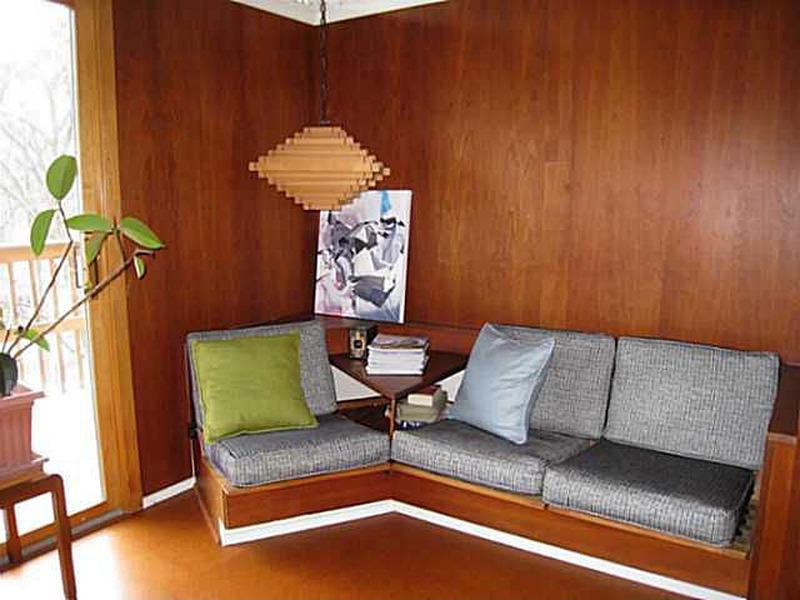 But then I started feeling guilty about ‘destroying’ something that was original to the house. I digress…. Neat features – notice the white framed screens – they are actually sliding screens – think Japanese screens – that can close off/separate up the main rooms. The property has 3.4 acres with fruit trees and berries on the property – along with wildlife (deer, turkey, etc.) – the house is next to a christmas tree farm. This house has municipal electric (ie. cheap) but they also installed Geothermal heating (ie. cheaper). Making the utility bill for this house ~$1,000 for the whole year – including all the heating and cooling. Weird things – at one point someone in this house had a dog grooming business. So there is a separate entrance from downstairs – next to the garage. It has a counter and a half door access – as well as a full sized bathtub lifted up on a platform about 3 feet in the air. Also it was noted that there was an old VW somewhere on the property that was part of an art installation. Other – it didn’t quite meet our specs – we live on a fairly main road now – this house is also on a main road. We were hoping that our next house had a bit more of a neighborhood feel. It’s hard when you enjoy things like Halloween and you are lucky if the next door neighbors stop by in their cute costumes for some candy. But overall – we liked it enough to give it a try. We knew there was an offer already – so we put our offer in at full price. We filled out all the paperwork while eating dinner in Florida (New York State accepts electronic documents as legal and binding). 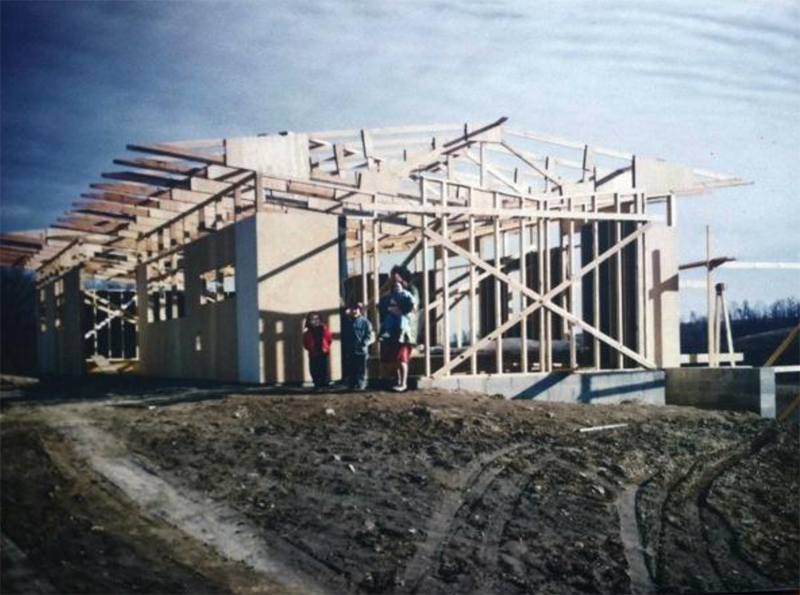 When sharing our excitement with our family over dinner – we told them about the family who built the house. Almost immediately my Uncle says “I remember the Gundlach’s” – turns out some of my family attended high school with the son’s of the family. They had dropped my Uncle off once in Fairport when he was hitchhiking back from somewhere – he remembers that they were always on the ski club back in the day. Weird coincidence. So after you put an offer in on a house – then you wait. We actually didn’t have to wait too long, but it was long enough for us to start thinking about living there. That same night probably sometime before 11PM our realtor called us back and broke the news – there ended up being a total of 3 offers. They took the “much higher” offer. If I had to guess I would say that the last people already knew there were two other offers and just made sure their offer was an offer the sellers couldn’t refuse. Bummed we had to start the process all over again – we knew we would have to keep looking upon our return to NY.